Black holes aren't surrounded by a burning ring of fire after all, suggests new research. 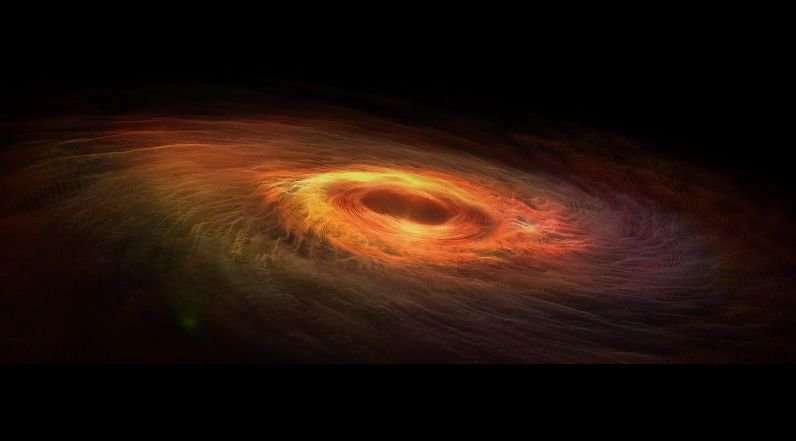 The new study builds on previous work from 2004 led by Mathur that theorized that black holes are basically like giant, messy balls of yarn—fuzzballs" that gather more and more heft as new objects are sucked in. That theory, Mathur said, resolved the famous black hole "information paradox" outlined by Steven Hawking in 1975. Hawking's research had concluded that particles entering a black hole can never leave. But that ran counter to the laws of quantum mechanics, creating the paradox. We need Pop-Cosmology aficionados to come here & explain what the hell we just read. Just more string theory pseudoscience. Untestable crap. See faerie tales of imaginary conjecture above in article and at link DNP left. From the article: ""Once a person falling into the black hole is tangled up in strings, there's no easy way to decide what he will feel." I doubt that he would feel anything, unless the dead can still feel. Tangled up in "strings"? Is this similar to a spider's web that has entangled a flying insect and holding it fast? So black holes litterally are the recycling trash cans of the universe and effectively just a collosal version of a yoyo. I too, have thought that for many years, where they are comparable to trash cans on street corners of most cities. Here's my take on the pop cosmology version. Imagine you are sailing in a straight line. If you believe the "ring of fire" theory, then the world is flat. You will expect to be crushed to nothing between the sky and the water where they meet at the hard line of the horizon. The end. If you believe the "ball of string" theory, then the world is round. You will expect more and more of the world to open up and be revealed to you as you sail toward it. What was small or invisible will get ever larger to your sight the farther you go. You will never reach the horizon, but you will pass far behind the line of sight of anyone on the shore. No Theory has been proposed! Try q. Charge is the geometrical center of an infinite asymptotic field. Each charge is unique: Superposition applies! Etc. Logic, Theory defined from an existence proof! "Once a person falling into the black hole is tangled up in strings, there's no easy way to decide what he will feel." uh he will feel dead? TheGhost, I was considering a comment along these lines, thank you. This is the only kind of a comment this stupid article deserves, as there is no substance to even argue with. Not even wrong.